Tagline: Some may pass the test . . . God help the rest. A slasher movie that shows restraint is a rare and commendable thing. Final Exam shows that restraint, it just never really goes anywhere. Looking back at the 80s slasher boom and the rashly sliced videotape entrails that would follow, you immediately think of Jason Voorhees—an indestructible killing machine who would plunder his way through six instalments before the decade was out thanks to a plethora of cynical gimmicks that kept the franchise relevant, but series stalwarts like Jason were exceptions to the rule. After the initial buzz which saw a whole generation of teenagers flock to picture houses and watch weakly sketched representations of themselves being hacked to pieces, directors struggled to keep the formula fresh, and before long all storytelling went out of the window in favour of who-can-top-this? bloodbaths. Forced to cut corners, cast members would double-up as on-set accountants. Believe it or not, this wasn’t always the case. After John Carpenter bucked the trend with low-budget masterpiece, Halloween, many business men saw the slasher genre as a foolproof way to make a quick buck and began throwing money at eager young filmmakers who promised to turn their thousands into millions. I mean, this is only trash cinema for mindless miscreants. Surely there’s nothing to it, right? You could perhaps forgive those in the business community for thinking so. On the surface of things, Carpenter’s blueprint was quite simple. All you needed was a killer (preferably a big fellow in a mask), a bunch of pretty young teens and a semi-professional production crew who at least knew their arses from their elbows. Throw in a relatable setting and a catchy theme and the rest can be pulled out of a genre textbook. Not one for iconic masks, Final Exam’s killer preferred the sports-casual look. Unfortunately, it’s not that simple. Not only do you need the instincts and resourcefulness of a genius filmmaker, you need everything to fall into place at the right time, which takes not only skill, effort and ingenuity, but a considerable shot of good fortune. It’s not every director who can snag three days worth of a cash-strapped Donald Pleasence along with the kind of breakout star who would come to define the genre’s pivotal ‘final girl’ in Jamie Lee Curtis, and cutting the eyes out of a William Shatner mask and spraying it white to forge one of the most iconic villains in the entire genre may be resourceful thinking, but the decision’s lasting legacy is little more than sheer dumb luck. None of the pre-censorship slashers came close to reproducing that kind of magic, although some at least tried to emulate the technical and storytelling elements which made Halloween so engaging. In order for a hohorr to achieve the kind of palpable tension that makes all the killing worthwhile, audiences have to be able to invest in a movie’s characters, regardless of how stereotypical. If the writing is bad, then a vulnerable personality will do. If the story is peripheral, then a patient build and a well-timed jump scare can make all the difference. Hello? Police? You gotta help me! My friend’s stuck in a locker and he can’t get out! Made in 1981, Final Exam was released while the slasher was still very much in its infancy, and sticking to Carpenter’s formula was still enough to keep audiences interested. Writer and director Jimmy Huston understands that formula but fails to attain the right balance. On the one hand, the movie builds steadily, allowing its victims to develop personalities before inevitably meeting their maker. The problem is, the movie shows too much restraint, and while our largely elusive killer begins as an unseen fascination, by the third act you feel like grabbing his weapon and showing him just how it’s done. Events take place at a college campus. Students make out. Others play pranks (one of them fakes a mass shooting, no less), while those on the fringes see through the promiscuity and puerile antics, forming the kind of sweet relationships that make them contenders for survival. This kind of predictability one can overcome if you have the likes of Jason running around campus, but the aptly named ‘Killer’ has no such embellishments. Without an inspired Shatner-based Eureka!, we never see his face, he has absolutely no motive to speak of, and we never find out anything about him. In fact, he looks more like a quick-fit mechanic than a maniacal killer, with no distinguishing features to set him apart. The movie is admirably shot, its intentions are noble enough, but this is cut-and-shut storytelling at its most unimaginative. The fellas from the Gamma fraternity partake in their annual prank. The main problem facing Jimmy Huston was a simple case of evolution. The post-Halloween slasher was built on notoriety. It was cynical, notorious and single-minded in purpose. Audiences didn’t seek out movies such as Final Exam for it’s storytelling or artistic merit. They wanted violence, a fresh and creative kill to pollute their greying imaginations. Even Carpenter understood this when developing Halloween II that same year, reluctantly upping the gore to meet audience expectation in a sub-genre that had taken on a life of its own. When the success of a genre comes to depend almost entirely on excess, there is simply no going back. Critics deride slashers for their cynical portrayal of women and contempt for human life, but I defy anyone who would rather sit and watch one-dimensional characters build flaccid relationships for 90 minutes than see them have their heads chopped off. 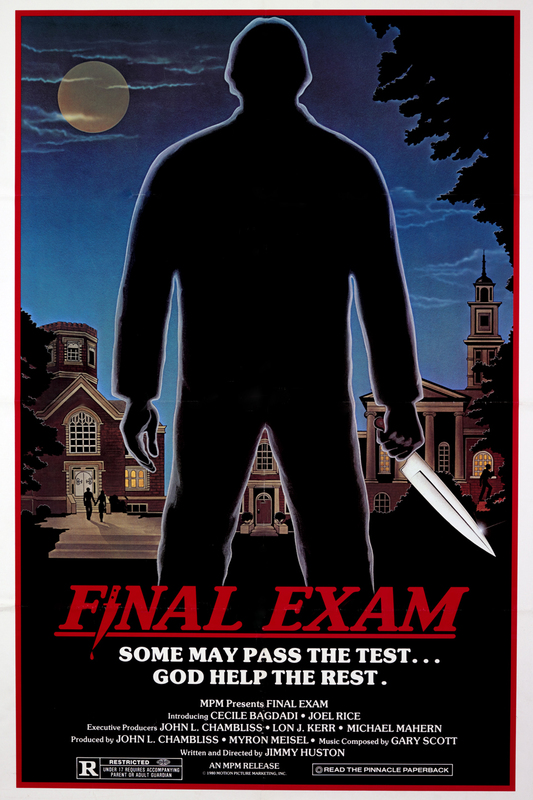 The poster for Final Exam shows a silhouetted figure holding a 12-inch butcher’s knife. If I was one of those critics, I would take this as fair warning. After all, nobody is making me watch. The decision to sit through the movie is mine and mine alone. I am not one of those critics, but what I do take offence to is a movie which advertises unabashed slaughter and then fails to deliver. Because that,dear readers, is about as cynical and lowdown as it gets. They are all equally unimaginative and lacking in gore, though the opening death, in which our killer rips through a car sunroof for a repeated stabbing, scores points for its seek-and-destroy qualities. On an otherwise serene summer’s day, a van pulls up on campus and the door slides open. Out of this van emerge a gang of men wearing balaclavas. Those men unfurl automatic weapons, pumping round after round into a group of students before speeding away with their bloodied corpses. What we don’t realise is that the bullets were blank and the blood was fake, and this is actually the latest can-you-top-this prank from the fellas at the gamma fraternity. Students scream for their lives and the sheriff is called in. But what if some kid calls the parent of a friend and informs them that their child is dead. That parent may then commit suicide, only for the presumed-dead kid to return home and find his mum cold and lifeless on the kitchen floor. Incredibly, those responsible are not arrested. They are not expelled or suspended. In fact, they don’t even receive a telling off. After witnessing an apparent Columbine, girly nimrod Radish has some valuable information for the local sheriff. Radish: Listen! Several students have been shot and kidnapped in a brown van. You’ve gotta get out here. It’s happening: The psychopaths are here! Presumably some kind of biblical prophecy. The first act has promise, and though the director displays some admirable technical skills and lurking POV shots, they never seem to lead anywhere. Add to this a series of unimaginative kills and a villain you would struggle to spot in a police line-up and what you are left with is one of the most underwhelming entries in the entire genre.